Theater audiences can’t help but shift to the edge of their seats when they hear these four sounds: Thump … thump … thump … creeeeeeeeeeeeeak. The combination conjures up images of castles, Igor and ominous wooden doors with deadbolts, doesn’t it? The show is performed with three stationary actors, one keyboard player and one Foley artist. 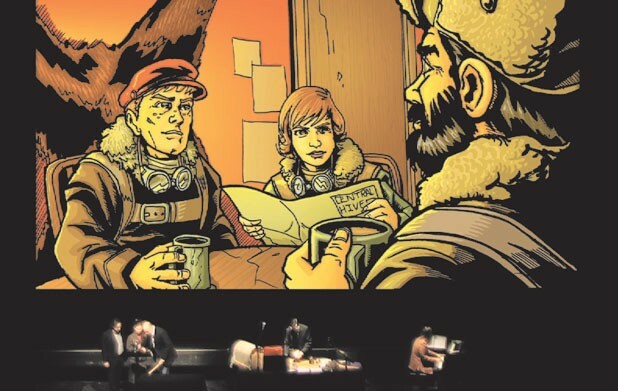 The stage backdrop features more than 1000 hand-drawn comic-book images projected in high def. The projections set the visual scene, but Nemesis isn’t a play or a film, so it also depends on a symphony of Moran’s sound effects, created on stage by Cami Alys. A trained musician, Alys uses “instruments” for the performance that fill two 8-foot tables, travel in military-grade suitcases with special foam cut-outs for each object and include slide whistles, plastic baby books, and boxes of mac-and-cheese (add a whistle, and you’ve got a surprisingly realistic speeding freight train). Moran and Nemesis creator Jason Neulander started making the sound effects in 1996, when their radio play was often performed live in coffee shops around Austin. In the beginning, Neulander and his cowriters were so enthusiastic about the sound effects that they frequently “wrote in everything including the kitchen sink, and then I’d have to find a way to create it,” says Moran. These days, they’ve pared the sounds back to a more manageable frequency, abiding by George Lucas’ decree to “only use sound effects when they further the audience’s imagination.” So you won’t hear every single whir and hum mentioned in the script, but keep an eye — or, an ear — out during the performance for thunder sheets, a “creak box,” shoes traversing various surfaces, cinderblocks and balloons. And, thanks to the staging of the show — Alys will be in the spotlight as much as the three actors — you’ll probably be able to watch most of those objects in action. Some of the sound effects, such as the rosin-coated clothesline that creates the creak, are part of any good radio artist’s toolbox, while others are handmade or everyday objects found by Neulander or Moran. As a result, Moran’s house is packed with surplus kitchen utensils, kids’ toys and other devices that evoke particular sounds he’s storing away for future inspiration. The objects themselves are critical to the sound created onstage, but equally important are the timing and intensity with which they’re played. When training to take over for Moran, Alys had to learn not only when to activate the object, but also how intensely to play it.